On August 24, 1814, as British troops approached the American capital, First Lady Dolley Madison insisted on saving important historical relics, including a portrait of our first president. Two years into the War of 1812, British troops were closing in on Washington, D.C. They began landing in Maryland on August 17, and were headed for the American capitol. President Madison had left the White House to meet with his generals, but instructed his wife to gather important state papers and wait for his return. Dolley and the White House staff waited anxiously, staring through spyglasses for either President Madison or the British Army. First the staffers tried to removed the whole frame from the wall. But it was screwed in and time was running out. They eventually broke the frame and removed the canvas. It was rolled up and stored away at a farmhouse outside the city for safekeeping. 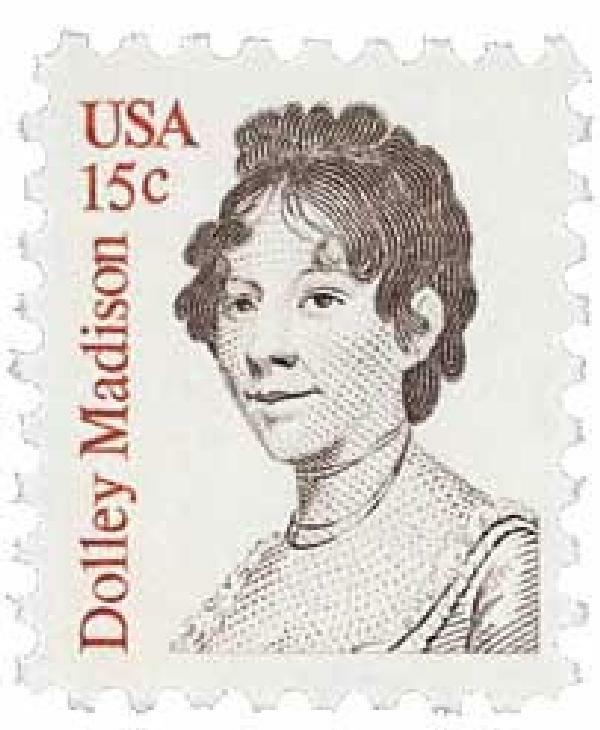 Dolley left the White House before the British arrived and met her husband at their established meeting point. Not long after, the British reached the White House, enjoyed a feast, and then burned the building. The Madisons returned three days later, but were never able to live in the White House again. Repairs weren’t completed until 1817. But Dolley had successfully saved the historic portrait that to this day hangs in the White House. Click here to add this stamp – and this history – to your collection. 17 Responses to "This Day in History… August 24, 1814"
Again a picture of the portrait would have been helpful to your article. I realize you are tying stamps to history, stamps you wish to sell. Here’s another bit of trivia for: the painting Dolley Madison saved was not the original, but a copy. Then where is the original??? And how did Dolly Madison get associated with those snack cakes at the supermarket? I didn’t know the painting she saved was a copy. What happened to the original? And is the original in the White House now, or is that the copy she saved? Thanks. I had heard about this in a college American History class several years ago. Thanks for the refresher, good stuff. Great idea…..Will be helpful especially to help make history lessons more interesting to young people to go along with the specific stamps. My grand daughter has shown an interest in stamps because, I believe, of the history behind them. Thanks to Mystic Stamps for organizing the information each day….. I enjoy your day in history very much. It is great to learn about the special people that we see on our postage stamps. Keep up the good work. tnx. I’m really enjoying these. it’s become like reading the paper in the morning. tnx. Which portrait of George Washington? Better to show it on the stamp,not the lady ? I love reading history but do not always have the time for a book….But one page a day is perfect. Thank you. To learn more about the featured items, click on the images. The images link to the specific stories on those stamps. I really appreciate these little history tidbits. I reminds me of the Stamps and Stories book the USPS used to publish. I learned a lot of history from those books. Thank you. For more history through stamps. Thanks Don and staff, Great information and great comments. As an Artist I find the adoration of the old portrates fascinating; so enjoy, also the details of certain bits of History we were not told about. We, America, is sure shown to be a willing fighter for freedom, do hope our stamina continues and we elect the best President to continue our struggle.